Take the short drive north from Scamander to reach St Helens. This area is a hub for fishing charters and is the perfect place try your hand at deep sea or game fishing. You’ll find delicious fresh seafood at the town’s fish punts and restaurants, like the Blue Shed Restaurant, Providore and Fishmonger, or Salty Seas Seafood market. There’s great shopping, cafes and art galleries here too. Explore the town to discover gems like the Lifebuoy Café and Quail St Emporium, East Coast Village Providore and the Suncoast Gallery. Visit the History Room at the St Helens Visitor Information Centre to discover the Trail of the Tin Dragon—a series of experiences from St Helens to Launceston that tells the story of Chinese tin miners who lived and worked in north east Tasmania. St Helens is the gateway to Binalong Bay and the world-famous Bay of Fires. Here, you’ll find a range of coastal accommodation and classic east coast white sand beaches to explore. 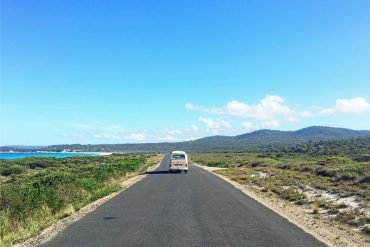 This is the location for the award-winning Bay of Fires Walk—named one of the eight Great Walks of Tasmania. From St Helens, you can also take the one-hour return walk to the beautiful Peron Dunes and the vast ocean beach. Travel inland from St Helens to reach Pyengana, and visit the Pyengana Dairy Company to sample award-winning cheeses and have a meal in the Holy Cow Café. Or, for a true Tasmanian country pub experience, visit the Pub in the Paddock—the St Columba Falls Hotel. Take some time for a side trip to Ralphs Falls and St Columba Falls—Tasmania’s tallest waterfall. Distance Scamander to St Helens: 19 km/12 mi. Driving time: 20 minutes. Distance St Helens to Binalong Bay: 11 km/7 mi. Driving time: 15 minutes. Interested in more? Read the next Itinerary. How long will I need, where will I stay?